How Significant Is This El Nino? For months we have been told how this is a strong El Nino, similar to the “Super El Nino” of 1997-98. How does it really stack up? As data for sea surface temperatures are not available before 1950, the Southern Oscillation Index (SOI) data from 1876 are the best for long term analysis. In this post I am using SOI data from the BOM archive. 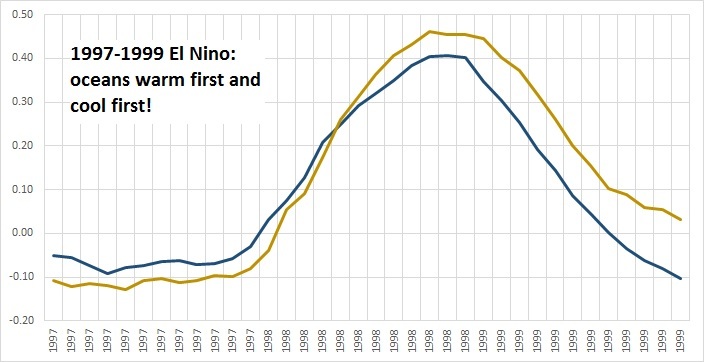 The next graph compares the length of El Ninos. Plainly 1941-42 was the one to beat, and El Nino conditions will need to persist for another 18 months to compare. Another four to six months is more likely, and of course there could be a double up of another El Nino next year (as happened in the 1990s). I next calculate the relative strength of El Nino conditions, by summing the (inverted) SOI values of all months in El Nino i.e. that have a three month mean of -7 or less. Unless we get another six months of values below -20 we won’t beat 1997-98 into fourth place. Of course, we are only in the seventh month of this El Nino- how does it compare with this stage of previous El Ninos? The November 2015 value is the black dot- in sixth place. 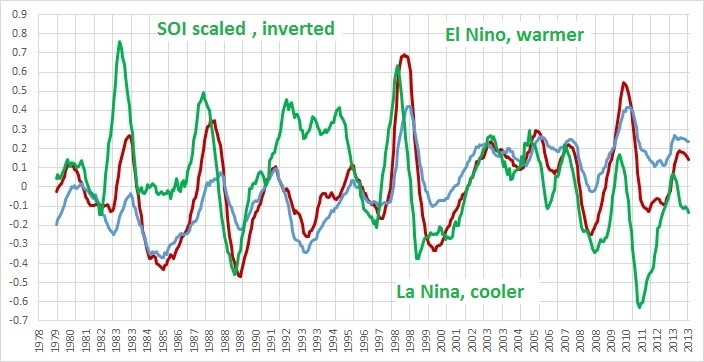 Another interesting method of comparison is to change the definition of “El Nino” to “El Nino or Neutral” i.e. periods between La Ninas. Note the two periods of nearly seven years without La Ninas in the 1980s and 1990s, separated by a 12 month La Nina- immediately followed by the 1997-98 event, and then another five year period. 2014-15 is not unusual. Currently this event is in 12th place, and if it runs strongly for another six months it could sneak into seventh place. Compared with other events, at the 22nd month this event ranks fourth. The current El Nino event is not going to break any records, unless it continues for several years! It is nowhere near the most intense, nor the longest, nor the strongest. It cannot compare with the intensity of previous El Ninos, as measured by three month average values, such as in 1896, 1905, or 1983. It cannot compare with the length of previous El Ninos, such as the 1941-42 event, or the series of years of El Nino and neutral conditions in the 1980s and 1990s. Depending on the measure used, it is fourth or sixth strongest for this stage of the cycle. If it continues strongly, its final strength might reach seventh or perhaps even fourth place. But that is unlikely. According to the Bureau, this event will peak before the end of 2015, and finish by mid-Autumn. Despite the hopes of the global warming enthusiasts, this is just another moderately strong El Nino which may cause a spike in world temperatures in the first half of next year, but is nothing to get excited about. Yesterday the ABC hyped up their climate alarmism to another new level with their uncritical and unabashed reporting of a claim by the CSIRO that “Extreme La Niña events … will almost double in frequency as the climate warms”. Increased frequency of extreme La Niña events under greenhouse warming, by Wenju Cai et al., published yesterday. The authors say they used climate data from 1900 to 2005, and 21 climate models to predict conditions for 2006-2099, and that an extreme La Nina is defined by Central Pacific sea surface temperature anomalies of more than 1.5C below normal. They claim that an increase in severe El Ninos will lead to an increase in following extreme La Ninas. In the paywalled article I suspect the Central Pacific region they use is actually the Nino 4 region. In this analysis I use data from the Nino3.4 region, which is the overlap between Nino 3 and Nino 4, covering Latitudes 5 degrees South- 5 North and Longitudes 170 degrees West- 120 West. This is the most common data region used. I downloaded data from http://www.esrl.noaa.gov/psd/gcos_wgsp/Timeseries/Nino34/ and calculated monthly anomalies from the 1961-1990 means. There are data from 1870, however I chose to use data from 1876 to match Southern Oscillation Index (SOI) data. Fig.1: Nino 3.4 anomalies. Note 1900 & 2005 limits, and +/- 1.5C thresholds. The paper claims that the incidence of extreme La Ninas will increase from one per 23 years to one per 13 years. While there are more extreme La Ninas in the last 45 years, I count seven La Ninas from 1900 to 1999, which is one per 14 years. There were three very high El Nino peaks since 1970, but there are clusters of extreme El Ninos in the first and last thirds of the record. So possibly the claim for increased La Nina frequency was for an increase in the frequency of abrupt swings from El Nino to La Nina. 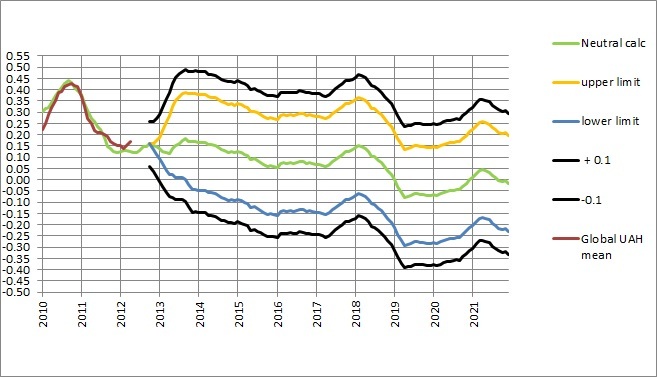 Fig.3: 12 monthly change in Nino 3.4 anomalies. +/- 3C is the threshold for swings from extreme El Nino to extreme La Nina. Fig.4: Removing the clutter, change exceeding +/- 3C. There we have it. The extreme changes since 1900 have all been in the last 45 years. Is this due to Greenhouse warming or natural climate change? Could it have anything to do with the Interdecadal Pacific Oscillation? Or is it an artefact of my arbitrary choice of extreme threshold? 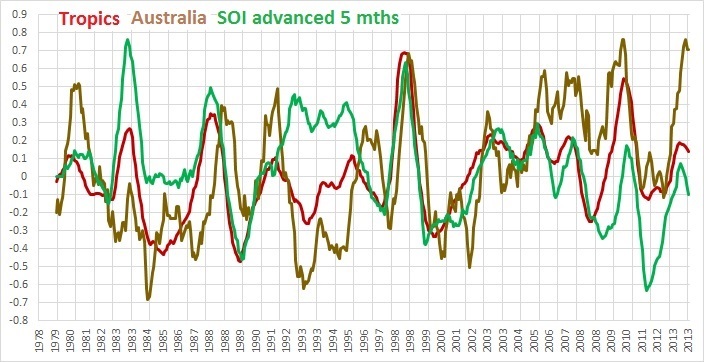 More importantly, does the Southern Oscillation Index (SOI) tell the same story? 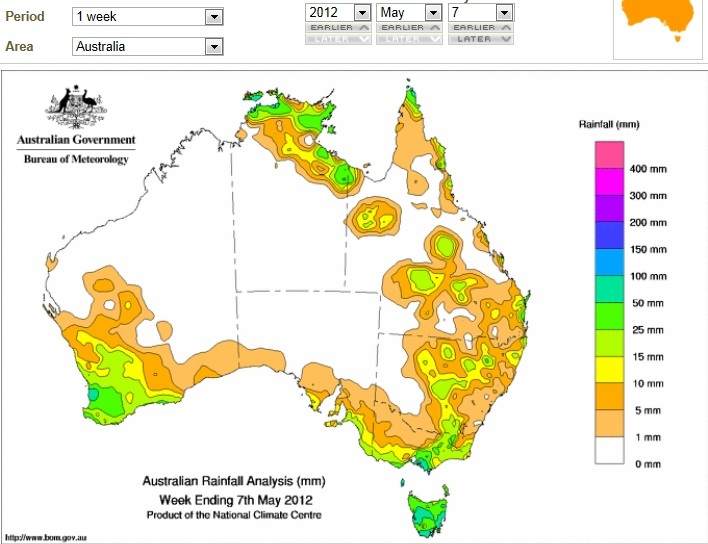 SOI data are from the BOM website. Fig.5: 12 month running mean of the SOI inverted. Threshold is +/- 8. Note the historical rises and falls. Fig.6: Nino 3.4 and 12 month inverted SOI match fairly well, although SOI values lag by up to 2 years. 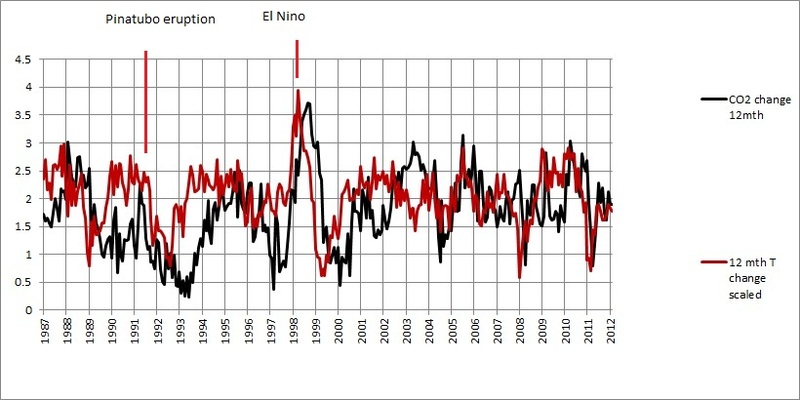 Fig.7: El Nino and La Nina conditions per SOI criteria (+/- 8). An extreme ENSO event might be +/- 16, although I have not seen that mentioned anywhere. Again note the clusters of El Ninos, and the spread of La Ninas, in small groups with large gaps between. Fig.8: 12 month SOI change exceeding +/- 16. 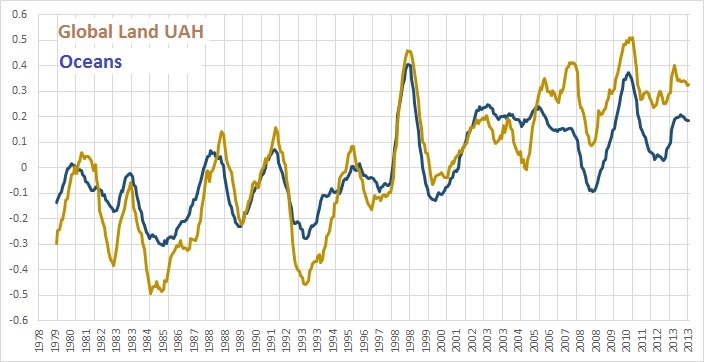 Horizontal lines indicate the threshold for an annual swing of +/- 24 units, which is associated with some dramatic weather events. I left all of the changes >16, to show the historical spread. Note there were three extreme La Nina (< -24) changes from 1876- 1916, and three from 1960- 2000, and four from 1973- 2014. There is no unusual trend. 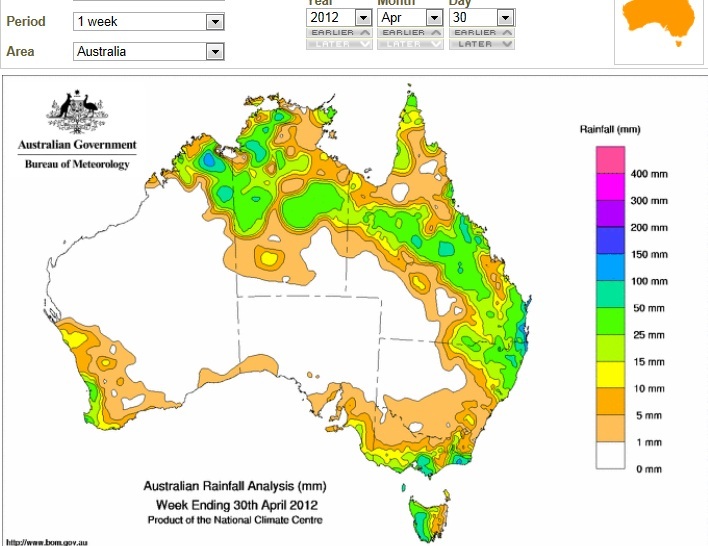 How does this correspond with the observed rainfall record, especially for South East Australia, which is predicted to receive more extremes of rain and drought due to greenhouse warming? Fig. 9: Number of months of severe deficiency. Fig. 10: Number of very wet months. 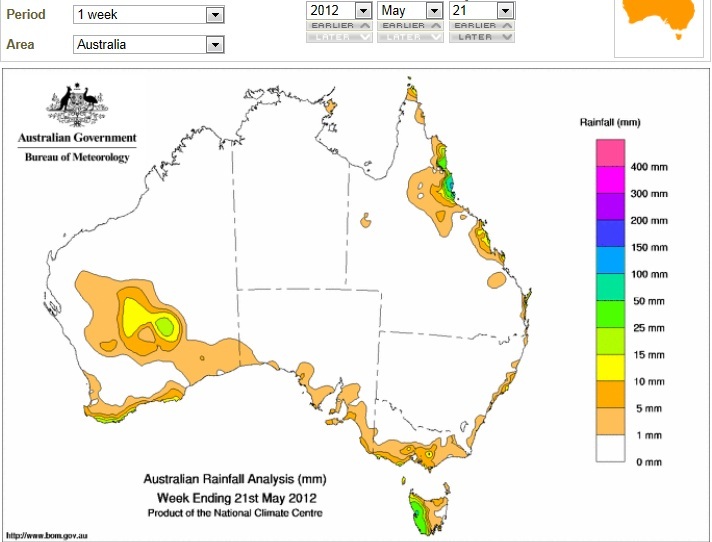 Queensland is especially susceptible to ENSO events. Fig. 11: The match for Queensland wet years is better. Fig. 12: But not for droughts! Where are the extreme El Ninos? Call me underwhelmed. Depending on the index used, the criteria used, and the length of the record used, you can say we’ve had an increase in extreme ENSO swings, or no noticeable change other than a long period (70 to 90 years?) cycle of more and less extreme changes. My money’s on the latter, but Time will tell. Here’s a fresh look at global temperatures as calculated by the University of Alabama, Huntsville- the UAH dataset– from satellite measurements of the Temperature of the Lower Troposphere (TLT). Warwick Hughes suggests that there has been a drift in the measurements since about 2005, such that calculated temperatures are too high, and we await a proposed correction. However, we can live with that. Here are plots of TLT for various regions of the globe. Fig.1: 12 month running means of Global anomalies and Tropical anomalies (the region of the Earth between 20 degrees North and 20 South, which gets the majority of the solar radiation striking the Earth). The two sets move in lock step, with a much larger variation in the Tropics than the world as a whole. What causes these large variations? Fig. 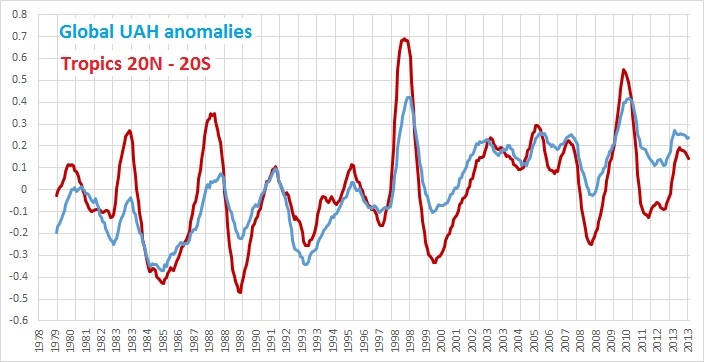 2: Global and Tropical anomalies with the SOI inverted, and scaled by a factor of 30. SOI is the acronym for the Southern Oscillation Index, calculated from pressure differences between Tahiti and Darwin, and is a reasonably good indicator of El Nino or La Nina conditions. The ENSO cycle (El Nino Southern Oscillation) originates in the tropical Pacific. El Nino brings warmer temperatures to the world; La Nina is associated with cooler temperatures. I have inverted the SOI to show this relationship, and scaled it down by 30 to fit on the graph. Note how the 12 month mean of SOI precedes the temperature data. Here’s a plot with the SOI advanced 5 months. While the peaks (El Ninos) match very closely, I have marked periods following the major eruptions of El Chichon and Mt Pinatubo, which cooled temperatures for several years. I also suggest that the atmospheric dust and cooler surfaces upset the ENSO cycle as traced by the SOI. Note also that temperatures in the 2010-2011 La Nina appear higher than expected. Fig.4: SOI advanced with Tropic and Australian land TLT. Note how Australian temperatures appear to fluctuate about as much as the Tropics (we’re one third north of 20S after all). Australian temperatures are influenced by events in the Indian Ocean and Southern Ocean as well as the Pacific, so the match isn’t exact. I will look at Australian data specifically in another post. Finally, here’s a way to check on that other “finger print” of the enhanced greenhouse effect, as espoused by Dr Karl Braganza: land areas are expected to warm faster than oceans, supposedly showing that greenhouse gases, not ocean currents, drive global warming. Fig. 5: Global Land and Ocean TLT. Well of course that proves it- land areas are indeed warming faster than oceans. However, have a closer look at the timing of the switches between warming and cooling. If well mixed greenhouse gases are warming both land and oceans, it would be expected that oceans, with higher specific heat and enormous thermal inertia, would take longer to warm. The land response would be almost immediate. Oceans would not be expected to warm before the land, and if anything might show a slight lag. Fig.6: close up of the 1998 Super El Nino. The oceans change phase about one month before the land. They definitely do not lag behind. And what causes these rapid changes? Fig.7: Land, ocean, and the SOI advanced 5 months. So far in December there has definitely not been widespread or heavy rain, so I should stick to forecasting dates when a weather enhancement is more likely rather than how much rain can be expected. However, the predicted timings line up very well. BOM mentioned instability on the 1st, and a low developed off the coast in the next few days but went south rather than west- northern NSW got this influence. There were isolated storms about with light rain, and of course the very hot weather around 4th and 5th, with a large change. So instead of heavy rain we got extreme heat! Further storms around in the past couple of days- well within the +/- 5 days range. It is still very dry, with only coastal showers. Humidity is building, the monsoon trough has moved south into the Coral and Timor Seas, with cloud streaming down from Indonesia through Western Australia. 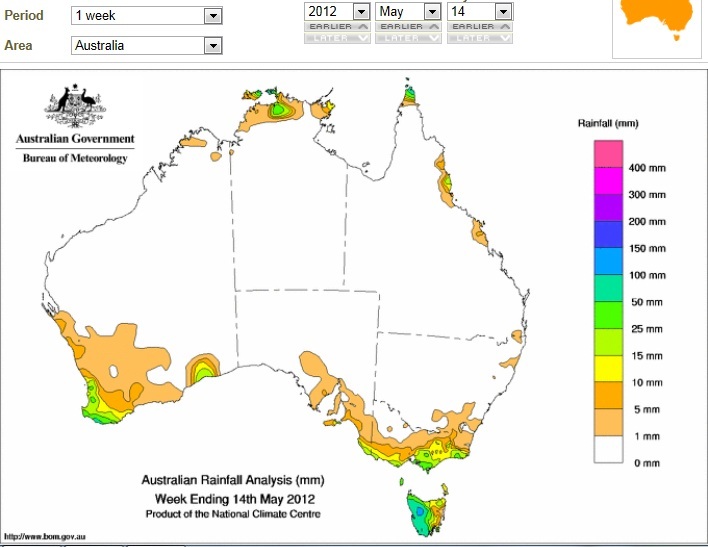 The Wet season is getting closer. 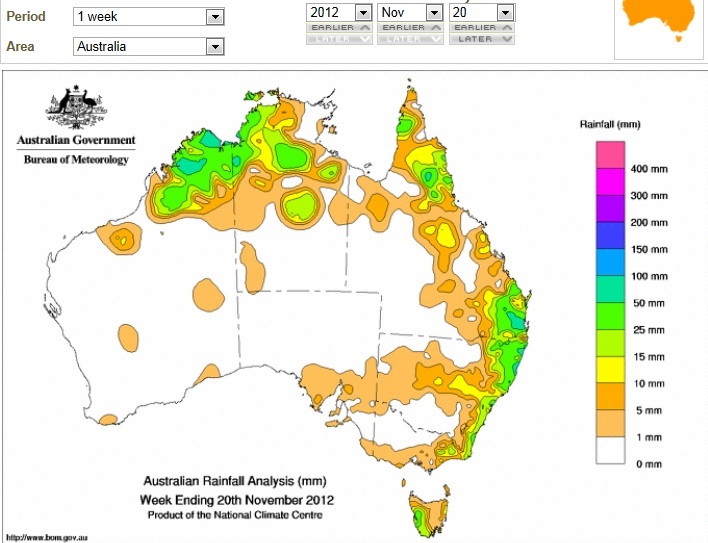 We may even have a rain depression or cyclone before the end of the year in North Queensland. I’m still tipping a major disturbance mid to late December with surges around 18-22 and 26, plus possibly 30 (and probably 2-4 January), all +/- 5 days. I expect this to bring heavy rain, especially in the week leading up to Christmas- but I’ve been wrong before about rain intensity! I again mention that rainfall is measured at 9.00 a.m. on the day after it falls. 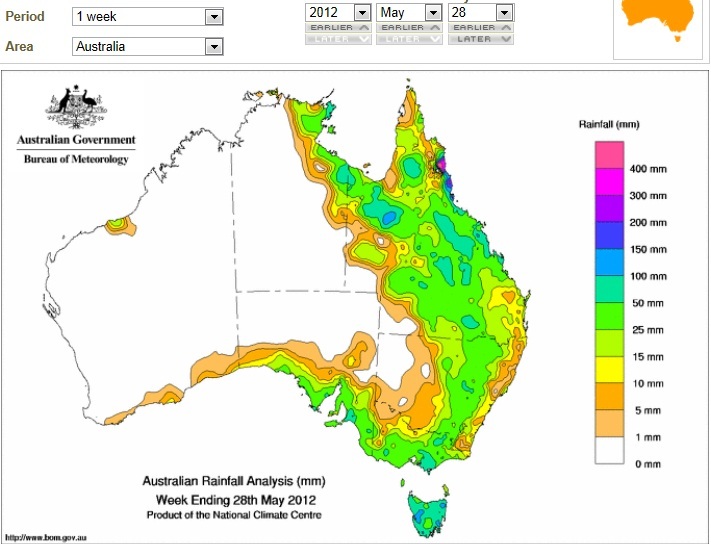 As well, my method captures the average of 3 day rainfall anomalies across 10 sites in subtropical Queensland. I do not predict rain for specific locations. I won’t change my outlook for 2013 for now but there will be some small changes. SOI 30 day mean (to 12 December) is -2.2 (neutral). Weekly NINO 3.4 Index (to 9 December) was + 0.37 (neutral). The Indian Ocean Dipole is currently -0.07 (neutral). I remind readers again of my area of interest- subtropical Queensland. Here’s a summary of my predictions since 1 August, illustrating changes and refinements to my methods as I attempted to be more precise. On 1 August I predicted enhanced activity for early to mid November and early to mid December. On 5 September I refined this to November 15 +/- 10 days, December 5 +/- 7 days, and December 16 +/- 7 days. On 20 September I changed this to November 13 +/- 10 days, November 26(? ), and December 4 +/- 4 days, December 20 +/- 8 days, and December 26 +/- 2 days. On October 5 I included November 7 +/- 3 days. On 6 November I added November 20 +/- 3 days, and December 9 +/- 3 days. 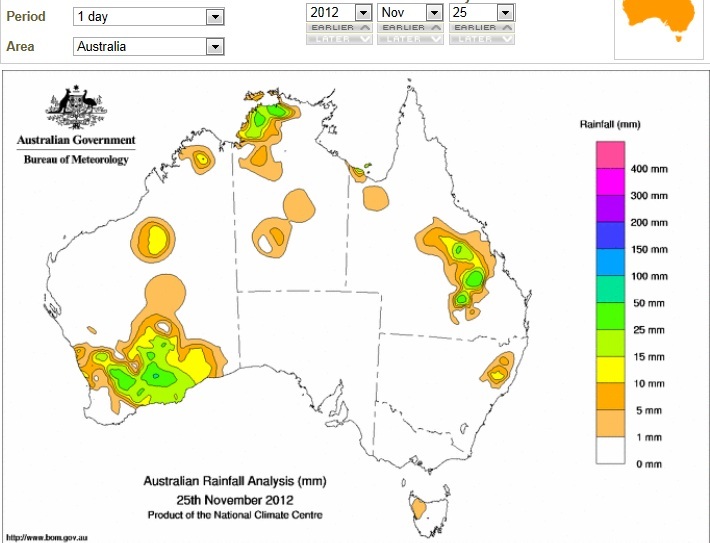 Violent storms passed through south east Queensland on 17-18 November. There were scattered storms on 22 November (though no rain fell in the rain gauges I monitor) and on the night of 24-25 November a large storm brewed up in south west Queensland around Augathella and moved rapidly north east, reaching the coast at the Whitsundays next morning. The graph shows this as a small blip, as only 16mm was recorded at only one of my sites (Clermont Aero). I’m not sure whether to attribute this to the predicted surges for 22 or 25 November- the next couple of days will tell if we get a disturbance from the system bringing rain to Victoria at the moment, but that is more likely to be the 1 December disturbance. There will be further activity in early December (possibly a small event around 1st, with a larger system with widespread rain around 5th +/- 5 days, and 9th +/- 5 days, most likely 5 to 9 December), and a major disturbance mid to late December with surges around 18-22 and 26, plus possibly 30 (and probably 2-4 January), all +/- 5 days. I expect this to bring heavy rain, especially in the week leading up to Christmas. This may include the appearance of the monsoon in north Queensland. If so the monsoon could return around 30 January and possibly 8 March. It will be difficult to match individual events with predictions (as they are so close as to overlap, and sometimes enhancements bring cloud but little rain), but I can say early to mid December, and mid to late December will see several rain events. I should mention that rainfall is measured at 9.00 a.m. on the day after it falls. All of the above +/- 5 days. I will concentrate on the accuracy of my algorithm (for want of a better word) for the rest of this year before I improve on forecasts for next year. SOI 30 day mean (to 25 November) is + 3.51 (neutral). Weekly NINO 3.4 Index (to 18 November) was + 0.39 (neutral). The Indian Ocean Dipole is currently +0.44 (neutral). 30 day mean Minimum percentage anomaly for the 10 subtropical Queensland sites I monitor (as at 27 November) was -0.005. It has been negative for all but 30 days of this year so far. With 34 days to go for 2012, the 365 day running mean is -0.29 and has been negative since 10 August 2011 so there is no doubt that this has been the coolest year of the last 10. 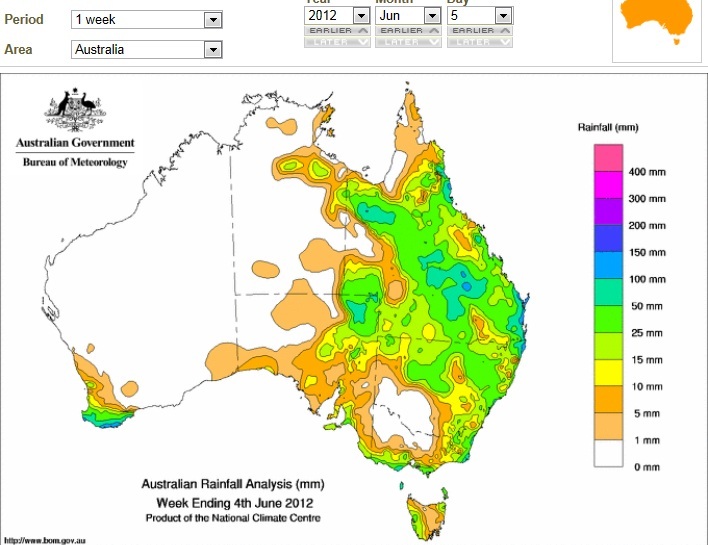 This page will be reposted around the middle of July, as soon as RAINFALL data for the previous month are available. However, after closely analysing rainfall and SOI data for a sample of Queensland sites (more on this in a later post), and reading an analysis by Willis Eschenbach, I have come to the conclusion that SOI is not a predictor of ENSO events, merely a symptom, like temperature and rainfall. Therefore SOI is not likely to have much long term use in predicting temperature. For this reason, this will be the final post concerning future temperatures, but I will be posting about rainfall in more detail. 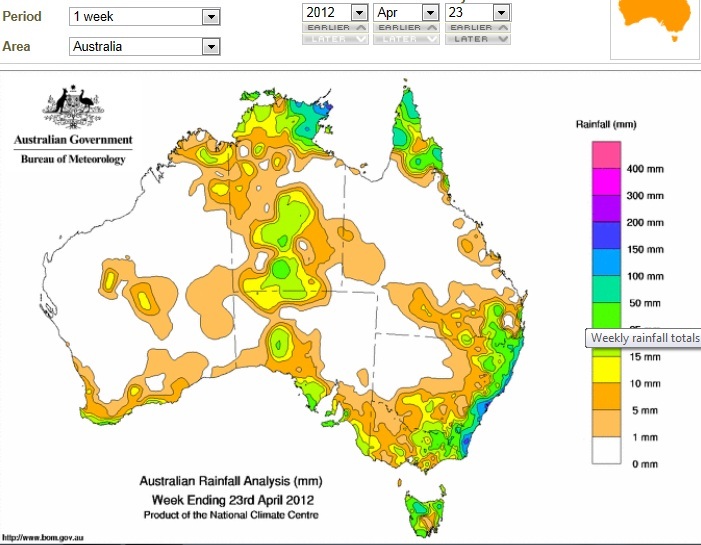 Last month I tipped “The next weather enhancement for SE Queensland and NSW will be in about five to seven weeks- late May to early June.” The weather co-operated, and the following maps show this, and as at 6 June there is heavy rain and wild weather in southern NSW and Victoria. The next major weather enhancement is likely to be late June to early July. 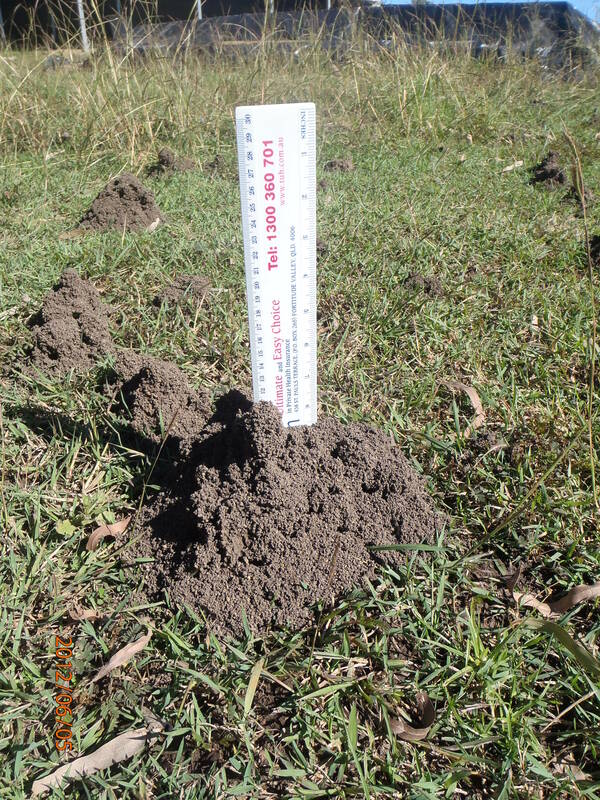 We are likely to have a wetter than normal winter- at least the ants think so! These ants regularly build higher chimneys on their entrances before wet weather. Their chimneys have been rebuilt since the weekend rain. Last April I demonstrated that changes in temperature precede changes in the concentration of atmospheric carbon dioxide. Here I look at the increase in CO2 concentration more closely, and how it relates to atmospheric temperature and the Southern Oscillation Index (SOI). There is no doubt that CO2 concentration has been rising, certainly since 1959, and that isotopic analysis shows this is largely due to fossil fuel burning. This is a graph of CO2 concentration for the past 5 years, 2007-2011. The regular seasonal wave shows fluctuations. There is another slowdown in February, March, and April 2011. 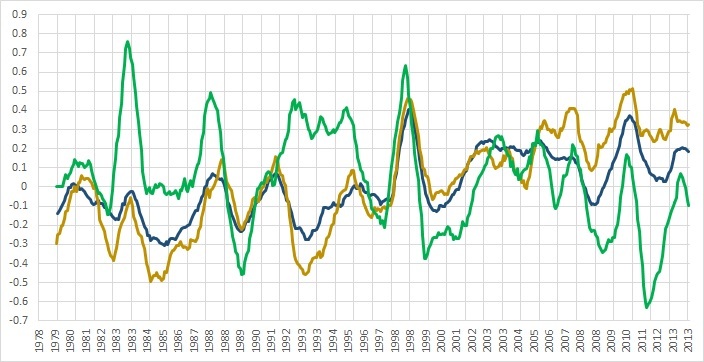 The difference between consecutive peaks, and between troughs, varies each year. These inter-annual differences interest me. Here is a graph of the inter-annual monthly differences- the difference between the same months in consecutive years, e.g. January 2010 and January 2011. 2010 was a very good year for CO2 increase. Note the huge slump in the rate of increase in April 2008, and the even bigger and longer slump around April 2011. In fact, April 2011 had the lowest inter-annual difference since July 2000. The recent State of the Climate report claims that “Global CO2 concentrations in the atmosphere increased from 2009 to 2011 at 2 ppm per year” which is correct- the concentration in December of each year has risen by 2ppm. 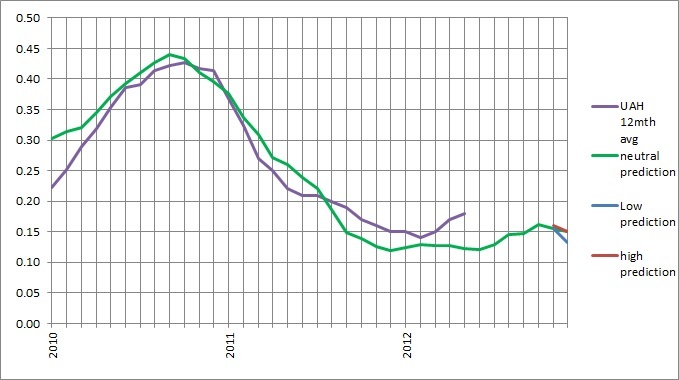 This was entirely due to 2010 however- by December 2011 the annual mean rise in concentration was down to 1.8ppm. 2011 was a below average year for CO2 increase. The BOM and CSIRO failed to mention this, I notice! There’s no comparison, is there? Here’s a graph (2007- 2011 again) showing the relationship between rate of change of temperature and rate of change of CO2. The temperature change has been doubled, and brought up to the same scale as CO2 change (2 is average). Notice once again that rapid temperature change precedes CO2 change by a couple of months. However, other factors may be involved. Notice mid-2009. Let’s zoom out and look at the 25 years from 1987 to 2011- actually, these plots show data up to February 2012. 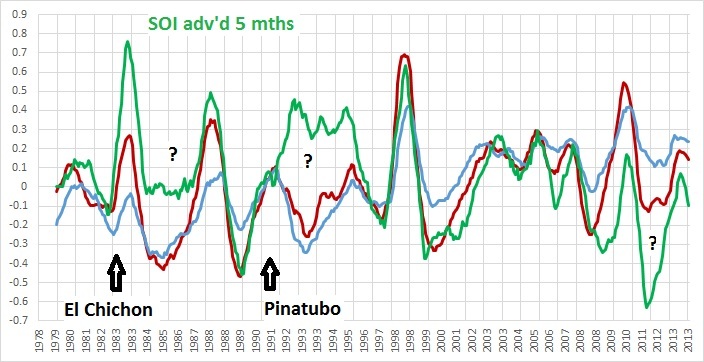 I have marked in the eruption of Pinatubo, and the El Nino event of 1997-1998. CO2 change can still be seen lagging temperature change. Now compare temperature change with SOI change. Note that SOI values are inverted. Note: temperature change clearly lags SOI change by many months. It has long been known that there is a link between ENSO events and CO2 concentration. So can we see a relationship between inter-annual change in SOI and CO2? There is at least 10 months lag between SOI and CO2 change. A pretty good match. El Ninos cause rapid CO2 increase. La Ninas and volcanoes are associated with slower CO2 increase. Removing UAH shows the closer relationship between SOI and CO2. Here the 12 month mean of SOI change has been advanced 10 months. Notice that in strong ENSO events the inter-annual change in CO2 can vary by more than 2 ppm per year. The 12 month mean of raw SOI (scaled: /20, +2) shows El Ninos occurring nearly a year before CO2 increase; La Ninas have a weaker match. Here are graphs of SOI vs CO2 since 1959: There are gaps in the CO2 mean because of missing months of data, after which 12 month means cannot be calculated. Notice the same pattern: CO2 change lags SOI change by nearly a year. Fig. 13: SOI change advanced 10 months. ENSO events are shown as well. Notice the very close match. CO2 concentration responds not only to temperature change but also to changes in the La Nina- El Nino cycle, nearly a year later. The ENSO cycles strongly influence changes in CO2 concentration- not enough to overwhelm it, but enough to double or halve the rate of increase. Much more study is needed. You are currently browsing the archives for the soi category.